About what we hoped for on day one, though the R&A's decision to go all final round on us with the hole locations probably prevented even better scoring. However, with the weather forecast turning a bit nastier for Sunday, they may have been saving a few more reasonable locations should the wind really blow. House and I kick around a lively day one at Carnoustie! "The British Open will be an all-cable major beginning in 2010"
The overnight ratings for ABC's final round coverage Sunday fell 14.6%, from a 4.1 to a 3.5. And this is surprising, particularly the dollar amount, which sounds awfully high. The British Open will be an all-cable major beginning in 2010 and be carried only on ESPN, ending a 50-year association with ABC, according to SportsBusiness Journal. The seven-year deal is not yet finalized but reported to be around $25 million a year. "It was not the great disaster it was built up to be - and I didn't think it would be." The new 'skateboard park' contours of the 17th green had been a hot topic of debate coming into the event, but it will be remembered for Padraig Harrington's winning eagle there rather than any calamities. "We will pause for reflection on it now, but we have nothing to announce about it this morning," stated Dawson. "It was not the great disaster it was built up to be - and I didn't think it would be." Open Championshp Question 2: Reinforcing The Beauty Of Flexibility? Coming off the U.S. Open at Torrey Pines, I'm wondering if the R&A's lack of first round flexibility, along with the clear lack of planning during architectural alterations only makes the USGA's Mike Davis and PGA of America's Kerry Haigh look that much more shrewd when it comes to getting the most out of a course's architecture by varying tees. Or do such course setup contrivances only belong in America where we don't have the weather to liven things up, and where such variety delivers the surprise and spontaneity that is already inherent in links golf? Open Championship Question 1: Did Padraig's Shot Save The 17th Green? By nearly all accounts the R&A/Martin Hawtree green installed at Royal Birkdale's 17th was out of character and disrespectful to Birkdale's architectural flow. But did Padraig Harrington's final round eagle set up by a brilliant hybrid shot (and help from a brilliant bounce) save this green cause? Since we're dealing with the stiffest of the stiff upper lips here, I'm voting that the green will not be touched between now and the next Open at Birkdale. Perhaps everyone was just a bit worn out by four days of wind and cold, but the Monday filings struck me as a bit uninspired. Turns out Padraig Harrington's wrist was strong enough to hit all the right shots in the British Open. Better yet, it was strong enough to lift the silver claret jug. On a day at Royal Birkdale when the game of golf never seemed tougher, the toughest competitor in the field prevailed to win his second successive Open championship. Budge over Tiger Woods, Tom Watson, Bobby Jones, Old Tom Morris and all you other legends on the Open Championship's top table. There is a new champion to join you in that exclusive club who have retained their title. Step forward, Padraig Harrington, the pride of all Ireland. 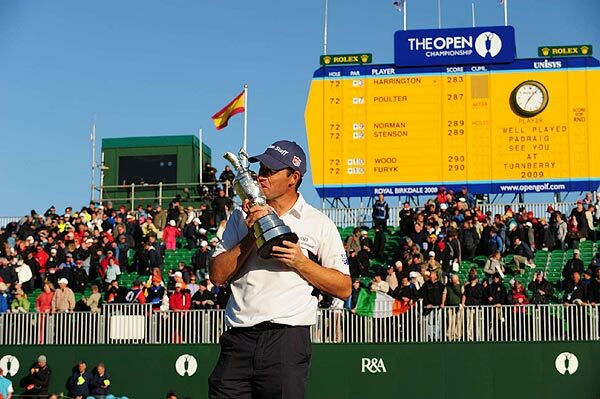 The first golfer from this side of the Atlantic to successfully defend the Open championship since James Braid last pulled off the feat at Muirfield in 1906, Padraig Harrington was acclaimed by history yesterday as Ireland's greatest ever golfer. As for Harrington, the wrist was the story. Ryan Herrington talks to Bob Rotella who explains why Padraig's wrist injury was the best thing that happened to him last week. And as Steve Elling writes, Padraig completely agrees. “I spend at least one session a day in the gym, every day, and I don’t enjoy doing that, but I do it because of the golf. I used to be a lot heavier than I am now; I would like to eat all the puddings and the pies, believe me. These are the sacrifices you’ve got to make, but the reason you do it is because you enjoy the end results, and you’re staying focused. It all leads to winning Open trophies. An American friend who once stayed at Harrington’s spacious home in Dublin found himself wrestling with a six-hour time change, and unable to sleep, got out of bed in the middle of the night to check his emails. It was then he heard the loud, piercing thud of metal hitting something, as if some car accident had occurred nearby. The visitor then heard it again. And again. It was Harrington, who’d awoken with a new swing thought in mind, climbed out of bed, and was hitting balls. As for the Shark, Martin Johnson says Greg Norman beat himself. "So, who do you think will win the Open with Tiger not playing?" It was a question everyone was asking before the tournament began, and if anyone had ventured: "How about a semi-retired 53-year-old, who squeezes in the odd round between business meetings, and has a severe history of choking," they'd have been quietly led away to one of those establishments where they take away your shoelaces and feed you with a plastic spoon. It so nearly happened, but Greg Norman was undone by the man he has always feared most in the final round of a major championship. Himself. The Great White Shark has a history of turning into a fish finger when the pressure is on, and although old age is supposed to make you forgetful, Norman once again managed to remember how not to win from the front. "Ready for a fun day?" Evert was asked by a reporter as they headed to the first tee. "I don't know if fun's the word," she replied before disappearing into a gallery of thousands. Tim Glover considers the epic week of amateur qualifier Chris Wood, silver medal winner and 5th place finisher did not get in the Masters, no matter how many times Tom Watson says it. The celebrity and the attention will not go to Chris Wood's head. After all, his sister Abi, who is travelling in Europe, sent him a text at the weekend: "Are you at that Open thingy?" she asked. He most certainly was in that Open thing and the West Country was on high alert. This was golf of the attritional variety, four days of it. Those wanting to see huge numbers of birdies and eagles at Royal Birkdale would have gone away disappointed, but they were not in the majority. In all, there were 12 eagles and 823 birdies, which compares with 5,015 pars, 2,310 bogeys and 391 double-bogeys or worse. Unlike recent Sundays at the Masters, Sundays at the Open have been thrilling, drawn-out demonstrations of the virtues of this old game played out in front of the most knowledgeable spectators. This year's was not just thrilling, it was one of the most thrilling. There were so many players involved in the denouement. Throughout a long afternoon, when the wind was gusting up to 40mph, it seemed less like a golf tournament that had been founded deep in the recesses of the 19th century and more like a grand prix around, between, over and under the magnificent dunes of this famous course. At one point, there were 11 competitors within five strokes of the lead; later, there were ten within four. Rarely have so many disparate characters been involved. John Huggan pens a column that I'll be taking issue with once the Open dust has settled. Mike O'Malley compiles final round player reactions. The chaps at Bentley will get a call from the R&A today when the term "ambush marketing" will be used. The Open has a lucrative deal with Lexus and officials were not best pleased to see a row of Bentleys being prominently displayed at Hillside golf club. "It's not the sort of thing one expects from a brand like that," sniffed an R&A spokesman. Those stories about all of the other players can wait another day, well most of them. This is about the Shark and the potential for something truly amazing to happen. I like his chances, because as Brian Hewitt noted the other night on Golf Channel, this has been the summer of extraordinary sports stories, so why not one more? This sounds familiar: Greg Norman goes to the final round of a major with the lead. And, no, we're not talking about 1996. If Norman gets it done at this age, at this stage, it would read like the greatest work of English fiction since Shakespeare was writing plays at the Globe Theater. All that remains to be seen is whether Sunday presents a comedy or tragedy for public consumption. They were right when they said it wouldn’t be the same without Tiger Woods. It’s been even better, in a funny kind of way. Apart from a fading legend who refuses to see sense, and an Asian who is trying to become the continent’s first major winner, the defending champion is clinging for dear life to the Claret Jug. Add to that a leading Englishman who isn’t even the most famous sportsman in his family, and this 137th Open Championship has had just about everything. In an often one-dimensional world where the vast majority of tournament professionals have the imagination and individuality of the average lemming, Norman provided a tantalising glimpse of days gone by with some beautifully crafted shots. His control of trajectory and distance in what were extremely trying conditions was at times the equivalent of a post-graduate thesis written amidst primary school pupils content to colour between the lines. The little punches under a wind that gusted to 35mph were a particular joy. The last time a golfer did what Greg Norman has a chance to do in the British Open, this name was Old Tom and the American Civil War had recently ended. "How come he still has that putting stroke at 53?" Faldo asked. "Where's the fairness in life?" First and foremost he is a superb athlete. He has, as Justin Rose said on Friday, "the body of a 23-year-old and the mind of a 53-year-old." He won't suffer from fatigue. Second, he is a magnificent striker of the ball, one of the best drivers the game has seen in recent years. On top of this he is excellent in bad weather. It is as if the wind has to be blowing hard and there to be a hint of rain in the air for Norman to come into his own. "Greg Norman is the best bad weather player I have ever seen," Tom Watson, the five-times Open champion said. Taking a break from a year of short-term gigs for players like Robert Gamez, Tommy Armour III and Phil Blackmar, Strickler was "raking traps for 150-handicappers" this spring at posh Sebonack Golf Club in Long Island. One day in May, "Today" show host Matt Lauer showed up with a guest, his good friend Greg Norman. Strickler had caddied for Norman in practice rounds a couple of times in the early '90s when filling in for Bruce Edwards, but he was surprised when Norman started inquiring about his availability. "I'm holding my sand-divot filler and my rangefinder, and the Shark asks me if I want to caddie for him at the British," said Strickler. "When he wondered if the club would let me go, I said, 'I don't care if they let me go or not. I'm going.' "
Alistair Tait wonders if Norman is producing the greatest golf fairy tale story ever, and though that seems a bit excessive, as Tait notes, "Norman plays more tennis these days than he does golf." Bill Elliott in The Guardian says it'll be the greatest Open win ever. Michael Buteau writes that "Greg Norman has been in this position seven times before and managed to win once." Mike O'Malley lists key player reactions, documents Saturday's tweaks to the course setup and looks at the long wait on No. 10 tee which prompts the question, do they not have the ability to throw a little water on them? Rickman, asked whether officials were considering suspending play, said, "It's difficult; it's a judgment call. . . . Mainly based on the greens. They've dried out in the sun, and if we get situations where we get balls consistently moving, are not staying where they came to rest or players can't replace them having marked, lifted and cleaned, then they would be indicating signs that if they became consistent problems then we would have to suspend play." Kim wasn't the only player experiencing difficulty on Saturday. Part of the backup came when Simon Wakefield, who shot a 70 and is three strokes out of the lead, watched his sand-wedge approach to the eighth hole finish off the green, only to see the wind move the ball. "The wind blew it three or four inches onto the green, so I was obviously able to mark it but then was not comfortable with playing the putt or hitting the putt because we were getting gusts," Wakefield said, concerned that the ball would move after he addressed it. "I spoke to one of the referees who called in, and they had had the same situation on the 10th, so we just sort of hung on and basically waited for the wind to die down." Geoff Ogilvy writes about four holes that might make a difference in Sunday's final round, including No. 17 where the green is "pure Disneyland." John Barton says the bookies like Padraig and lists the odds of other contenders. Gary Van Sickle likes K.J. Choi. Bob Harig tells us who the heck Simon Wakefield is. Michael Bamberger on what joy he's getting out of reading the local papers. John Garrity talks to Davis Love about Kenny Perry and player who pass on the Open. “I’ve got myself in trouble over the years chastising players,” Love told reporters behind the 18th green. “If you don’t want to come, don’t come. Kenny Perry is a great friend of mine, a great guy and a great Christian, and he’s doing what he wants to do, and he’s not complaining. That’s the way to do it. If you don’t like it, don’t come. If you don’t like the Masters, don’t play." Ballesteros, troubled by back problems and a serious lack of form, said from his home in the village of Pedrena, northern Spain: 'Birkdale was where my name started to be popular and I can't explain all the feelings I keep in my heart of that time. But I wasn't tempted to come back. And finally, ESPN posts the video of Rick Reilly's enjoyable end-of-telecast essay from Saturday's ESPN on ABC commercialfest. Can Norman do this? Your predictions please. There's a story book feel about this one, so why not go to the tabloids for our top game story? Dave Armitage of the Daily Star sums up the wild possibilities unfolding at Birkdale and like any good rag reporter, focuses on the Norman-Evert pairing. And speaking of tabloid fodder, check out ESPN.com's photo gallery. Image one is Chrissy greeting Greg at 18 and you can get a nice look at the rock on her left hand. It looks heavier than the Claret Jug. Neil Squires talks to Norman caddy and grizzled vet of looping lore Linn Strickler. Strickler, having seen all of Norman’s 140 shots so far, including the delicious curving putt from off the green at the last which secured another level-par 70 and brought the house down, had only one explanation. “I caddied for him a couple of times in the Eighties and nothing seems to have changed. He has still got it. This is HG Wells,” said Strickler. Which might, or might not, include being on parade before the world golf press for the first time in a while. Norman brought down the house when he was jokingly asked whether he was trying to make up ground on Evert, who collected 16 more major championships in women's tennis than he has in golf. Friday felt like old times in so many ways, Norman had to laugh. He was even asked if, given his admittedly low expectations entering the tournament, if he had made "alternate plans" for the weekend, since few in the media fancied his chances of surviving the cut. "Boy, I missed you guys," he cracked. Bob Harig cuts through all the Greg and Chrissy talk and asks the tough questions. Can he really pull this off? Conventional wisdom and a dose of common sense suggest the task is impossible. Debating England's aversion to ice might make for a better discussion than the ridiculous notion of Norman's contending again. The man has more scar tissue in major championships than any player, dead or alive, with playoff losses in each of the four Grand Slam events being just the beginning. But here he is, after a second straight 70 at Royal Birkdale, a shot out of the lead at the Open Championship through 36 holes. Nine years removed from the last time he threatened at a major championship. Eleven years after his last PGA Tour victory. I'd say that's a big no. Tim Rosaforte writes of Greg and Camillo's bond, one of Greg's many mentoring relationships with young players. 36-hole leader K.J. Choi is going to be patient, reports Mark-Lamport Stokes. Meanwhile, punters beware, John Hopkins says put your money on Choi. And speaking of patient and flying under the radar, David Dusek profiles Jim Furyk quietly lurking at +2 despite 66 putts over the first two rounds. He is enjoying the sudden rocket boost in his career thanks to the timely work of two people: Instructor Jimmy Ballard, a master of bad backs and the golf swing, and physio Cindi Hilfman, who is a master of the body and has been pivotal in helping him with his ailing back. Any time Mediate feels healthy and gets to a place where par carries great value, like at Birkdale, where winds have gusted past 25 mph the last two days and could reach gale-force levels on Saturday, he likes his chances. Certainly his mind is in a good, comfortable place. Even if looking back at Torrey Pines leaves him a tad dizzy. Jaime Diaz offers an interesting analysis of Phil Mickelson's struggle to put together four great rounds on a links but doesn't seem to rule him out as a possible contender this weekend, particularly if he gets a break with the weather Saturday. James Corrigan looks at Camillo Villegas and his inability to return to his homeland. Villegas was understandably guarded when, in the wake of the 65 that hauled him high up the leaderboard, he was asked about his homeland's troubles. "I love my country," he repeated several times, before saying: "I miss my home." The truth is, Villegas has not been back to Medellin, a city renowned for the activities of a certain Pablo Escobar, anywhere near as often as he would like. And one of the reasons for his absence seems a million miles from this genteel setting on England's north-west coast. The better the 26-year-old becomes known, the greater the danger of his being kidnapped. It is a simple equation that most prominent Latin American sportsmen must come to recognise. So Villegas, a flamboyant figure who has put golf on the front pages in Colombia, has had to cancel trips home. "Because things have changed a lot," he said earlier this year. "There has been a lot of commotion and reaction. Newspapers and the internet make it available for people to see how much money I make. It's not the most secure place. I'm just hoping people value what I do and that I'm trying to do the best for my country." John Huggan on amateur Chris Wood's amazing finish on 18. Mike O'Malley encapsulates day 2 player "observations." Steve Elling on David Duval, the first man to ever have a child. Could be because his world ranking has fallen to No. 1,087. For those looking for a little perspective on that figure, it's never a good sign when there's a comma in your ranking. For the past five years, Duval has been piecing his game back together as his family life has taken shape. He's now married with five kids, including two young children of his own. He's flattered, but slightly confused, that everybody keeps asking about the latter. But for a guy who always seemed a bit of a lonely figure, it's nice to hear that he has found roots and stability. "The difficulty now lies in actually leaving and going and playing. You know, I've become a very good country club golfer, and I enjoy carts and 2½-hour rounds and going back home." Watson would never say this, but the pace of his playing partners, Justin Rose and Aaron Baddeley, nice and respectful men though they are, had to be tormenting to him. Badds spends more time over the line of his missed putts than Watson would need to read and make three putts. He did say he thought they play better when they play faster. Doug Ferguson's notes include a John Daly wrap-up, Jack Nicklaus supporting the Olympic movement and the tragic passing of Fran Pruitt, wife of Dillard Pruitt and sister in law of Scott Verplank. Martin Johnson on Jack's brief RBS related appearance at Birkdale. He hardly plays now, as social golf was never likely to be high on his agenda, and clearing the hips on the downswing is a little trickier when one is artificial. Hard though it is to believe, though, he remains - at 68 - the only serious rival to Tiger Woods. Nicklaus was forever involved in duels, firstly with Arnold Palmer, then Gary Player, then Lee Trevino, and, perhaps most of all, with Tom Watson. Woods, though, is duelling with no one but himself, and without any serious contenders for his No 1 ranking, his sole motivation remains Nicklaus' record of 18 major championships. "I suppose you could say that Tiger's main rivalry is me and my record," he said. "That's his motivation, and he's so strong he doesn't really need anything else. But it would be so good for the game if he had one or two guys coming along to really push him." So is Nicklaus at all happy that Woods, who has 14 majors, will make no further inroads towards Jack's tally this year? Apparently not. "I would never be pleased to see Tiger not go after my record because of health issues. I even gave him the name of a real top hip specialist who worked with me many years ago, because his knee problems are related to his right hip, though whether he ever called him up I don't know." Nicklaus' main business now is course design, and he raised an eyebrow not only when I told him that John Daly was constructing one in Missouri - "Daly's designing a golf course?" - but that it would be well over 8,000 yards in length. The great man could barely suppress a snort. "Heck, Birkdale has had eight previous Opens, but for this one they've had to change 16 of the holes simply because technology was making it obsolete. Specifically the golf ball. Between 1935 and 1995 the ball advanced maybe 15 yards. Since then you can add on another 50 to 60 yards. ''This is why I'm sad when I see what's happened at St Andrews. How can you take one of the world's great courses, change it by building half a dozen new tees, and call it an improvement?" Jack's not sucking up to the R&A! "It's different now," he replied. "Of course, it's very easy to say things are either so much better now or worse. I try and equate it with other things – motor racing or film making or athletics. Jesse Owens was once the fastest thing on two legs and now your granny could run as fast. Perhaps we shouldn't try and compare, because everything is so different – the equipment, the courses and so on. It's only in fairly recent times they've put rakes in the bunkers. Once, you scraped the sand over with your foot. "The conditioning of the links has added something to the championship, but also taken something away. The players today require everything to be nearly perfect. If they land a ball in the bunker and it's plugged, they want to know why. Whereas Peter (Thomson], who could be very whimsical, would say, 'They're called hazards, and you're supposed to stay out of them. If you go in one, it's supposed to cost you, unless you play a very good recovery shot." Allis didn't replace Henry Longhurst as the BBC's main golf commentator until 1978. But he was behind the microphone on a part-time basis when Palmer won in 1961. He also played that summer and racked up another ninth place finish. "Birkdale is one of my favourites (on the rota]," he said. "It's flat and not that hard work for the players or caddies. It's also a reasonable walk for the spectators and a good viewing course. Because of its position in the country, it's an easy place to get to and the crowds are big. If they come on the railway, people don't even need a car. "There is an underground water system which has ensured that seven or eight holes, no matter how dry the summer, the fairways are green. Birkdale has never really been a hard, bouncy, fiery course, like Hoylake. That was a good exercise (to go back] there, though I'm not sure we saw it at its best. It would have been nice to have a little bit of green. But then you marvel at the way Tiger Woods appraised the situation. There's no rule which says you have to use driver off the tee. "Hard to keep track. Too many Kims and Parks." As K.J. Choi moves to the top of the Open Championship leaderboard, I have to post an item I missed while traveling. It's from Doug Ferguson's July 8 notebook that followed the U.S. Women's Open win by Inbee Park. Se Ri Pak inspired a nation of golfers from South Korea when she won the U.S. Women's Open in 1998, with players such as Inbee Park and Birdie Kim among many who consider her their role model. K.J. Choi, whose seven victories make him the most prolific Asian winner on the PGA Tour, was asked if he recalled Pak winning in 1998. Choi said he was living in Seoul and watched Pak's playoff victory on television. Asked if he paid close attention to the LPGA, however, Choi wore a look of confusion. "Hard to keep track," he said. "Too many Kims and Parks." The LPGA has 10 members with the last name Kim, and six with the last name Park. He didn't bother mentioning the six Lees. "Treat it as a par-5. I don’t see it as an issue." I understand that the R&A headman and part-time golf architect will be busy Saturday with the intense storm that Kevin Eason predicts should be epic, but something is just a bit off in his rather haughty defense of the long tee shot carries and unreachable par-4s. Others specifically singled out par-4 hole Nos. 6, 11 and 16, which were playing into the wind. As for the sixth, Dawson shrugged. "Six is 499 into the wind," he said. "It was a par-5 today, clearly. Treat it as a par-5. I don’t see it as an issue." "There's nothing wrong with the course," he said. Here's the twist. The extremes only work one way for Dawson and the R&A, who are clearly obsessed with scoring. He says treat the sixth hole as a par-5 when it's playing into an extreme wind. Fine, he's right. But why can't things swing the other way and be chalked up to seaside golf? Why can't a par-5 play "easy" downwind just be treated as a par-4 by the R&A? After all, the 17th was determined to need "stiffening" and a new green constructed expressly for this championship because it played like a par-4 last time around. What was wrong with the old one? Why it yielded too many birdies! So an excess of bogies and double bogies appears to be fine with the R&A. But an excess of birdies or eagles? Fire up the dozers! Golf was never meant to be fair but sometimes the game takes liberties with the fragile souls of those who would seek to write their name in history. 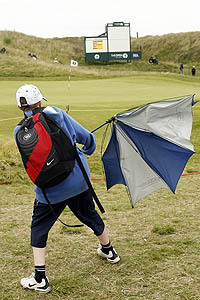 Yesterday's opening round of the 2008 Open championship was one such occasion, a day which began with players battling to make par as wind and rain swept across the Royal Birkdale links and ended with a pair of in-form - and lucky - players at the top of the leaderboard. For the second time in three years Graeme McDowell held the clubhouse lead in the first round of the Open Championship yesterday; yet this time around the Ulsterman appears so much more likely to retain this coveted position. Last week's Scottish Open victor is in the form of his golfing life and playing in the conditions that formulated his golfing life. McDowell is clearly partial to a bit of wind. Almost as partial as Royal Birkdale. Only two things qualified yesterday for the description of wild, large, Scottish and dripping wet - The Loch Ness Monster, and Colin Montgomerie. Actually, it's sometimes difficult to tell them apart, and if they ever acquire the technology to brighten up those fuzzy photographs, the mysterious denizen of the deep might turn out to be nothing more than Monty taking an afternoon dip. When Montgomerie leaves the scene of a double bogey, anxious parents wrap protective arms around their children and remove them to the kind of distance required of police by pedestrians when they've cordoned off an area suspected of containing an explosive package. And yet here he was, rattling up an ugly six with just the hint of a shoulder shrug, and whistling, at least metaphorically, que sera sera. There were, of course, some Monty moments, the best of which came at the par three eighth, when his duffed tee shot buried itself into a ghastly lie short and right of the green. Up until then it had been a little odd watching him playing in a sun visor, but at this point Monty removed it. Not because he had finally realised that it was not exactly the Costa del Sol out there, but because it was required to deliver a savage thrashing to his golf bag. 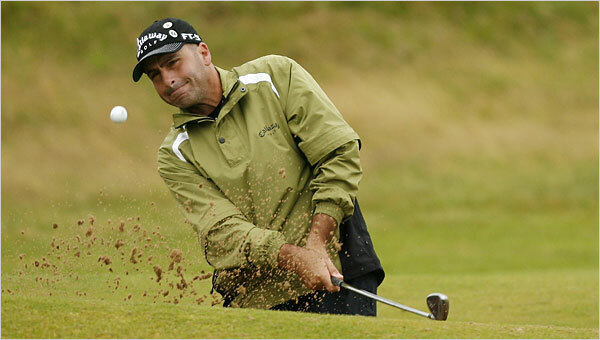 Larry Dorman focuses his game story on Rocco Mediate's stellar opening round. And Steve Elling notes that as great a story as Greg Norman's 70 was, U.S. Open hero Rocco is even bigger. Speaking of the Shark, Paul Kelso features Norman talking at length about this state of mind and Chrissy's influence along with her meteorological prowess. John Garrity writes about Rocco's back troubles. His body is so creaky that a full-time therapist has to follow him around, picking up any pieces of cartilage and bone that fall off. Today, after 11 holes, Rocco had to stretch out on a patch of marron grass behind the eleventh green while the therapist — her name is Cindy Hilfman — helped him snap his sacroiliac back into place. "Just normal stuff," Rocco says from the platform, making light of a procedure that produces a cracking noise you can hear from across the fairway. "It just keeps it loose." Tim Rosaforte reports that Rocco spent last week in Los Angeles watching a TiVo'd recording of the U.S. Open. "There's no doubt that the links short game is so different to what most people are used to," he noted. "Especially for the Americans. You can be chipping with lob wedges or hybrids or even 3-woods. The wind made a three-club difference, but I am pretty good at understanding the gusts. At the par three fourth in practice yesterday I aimed a 4-iron 20 yards left trying to hit a hard pull hook into a 30 miles-per-hour gusting crosswind. I thought, Wow, this course is tough." Mike O'Malley compiles the best of player comments on the morning conditions and setup. Kevin Eason reports that more such quotes could be coming with an ominous weather forecast for Friday and Saturday. The sixth is an intimidating par four a few feet shy of 500 yards, although in the conditions most of the fours were playing like fives. His second shot landed on a bank near the green and, from an awkward stance, he almost lost his footing as he dunked the ball into a bunker. From the sand he came out to within 18 feet of the flag. Westwood marked it, cleaned it, replaced it and had walked to the other side of the green to study the line of his putt. What happened next? A gust of wind blew his ball off the green and down a slope. Enter rule 20-3d: If a ball when placed comes to rest on the spot on which it is placed and it subsequently moves, there is no penalty and the ball must be played as it lies. Given the unreliability of his putting yesterday, the freak event might actually have done him a favour. Having faced a putt to salvage a bogey five, Westwood now faced a tricky chip and, lo and behold, the ball disappeared into the cup. "That was a very big moment," he said later. "That's the first time I've faced a putt that turned out to be a 30-yard chip." John Huggan says Thursday was another example of Tiger-proofing proving disastrous for the game, especially when Mother Nature does her thing. If you enjoy a rant, have a listen to Andrew Coltart on Radio Five. Soaked through and working as a commentator after failing to qualify as a player, he was asked about the course. The former Ryder Cup player promptly let rip. "A 490-yard par four that you can't reach in two, what's that about? When athletes start running the 100 metres too quickly, they don't suddenly make it 102 metres." Duval's vision of the big picture, though, is hampered by lack of opportunities to perform. To play well again, he must play often. Kevin Eason covers Justin Rose and Tom Watson, who played together and carded matching 74s. Rose also writes about the round in his online Times diary where he takes us through his day. Mike Aitken's Scotsman game story highlighted Sandy Lyle's early WD while John Huggan in the Guardian says the ramifications of Lyle quitting will be huge. Among Lyle's various adventures were leaving a ball in a bunker at the short 7th then having to play out backwards, seeing his approach shot to the 8th ricochet off the ball of his playing partner, Graeme Storm, and finish 30 yards off the green in deep rough, and making a final-straw triple bogey at the 414-yard 9th. "There will be other times in the future," he said. "I'll survive." But, perhaps more pertinently, will his reputation? A letter writer to the Herald is even more blunt: "Sandy has wasted a tee-off time that any number of up-and-coming youngsters would have killed for. One can now scratch his name off the Ryder Cup captains list." Even worse for Lyle, The Times ran this headline: "Sandy Lyle's captaincy ambitions disappear after he quits." Then again, they declared the 2014 job Monty's last week, so they clearly know things we don't. The beauty of a tournament like the Open, a melting pot of golfing excellence, is the vast contrasts — of nationalities, body types, playing styles and, as the example of Lehman's group so colorfully illustrated, ages. "I still play on Tour, and over in Europe, so I know most of these guys," said Lehman, who shot a four-over 74, five shots off the lead. "Here's what I know about the young guys: If you call them they'll never answer their phone, and they'll never call you back. If you text-message them, they'll answer in 20 seconds." Mike Aitken files a note on Mark Calcaveccia's wife WD'ing from caddying in round one, sending Calc on a mad dash to find a last minute looper, who turned out to never have walked the course. Eamon Lynch files an anecdote about Anthony Wall's nickname. His mother had better not read this one. The live blogging duo of Shipnuck and Van Sickle will be at it again from their respective home towns. I'm not sure what's more amazing, that Shipnuck is going to get up at 4 a.m. to do it, or that two of SI's top writers are not at Royal Birkdale. "You know you're at the British Open when you come inside to change rain suits," he said. And finally, summing up the brutality of the morning weather, Cameron Morfit notes that the first 15 groups averaged 77.34. 11:15: TNT is pretty much proving that eight hours of golf coverage is way too much. Paul Azinger provided some spark, and so did venerable Peter Alliss when he signed on after 11. Azinger and Alliss make a difference because they actually have things to say. Allis came on the air and immediately said, "Par at 70 is slightly ridiculous but that is the modern trend, knock a couple strokes off so nobody makes our course look foolish. And nobody has." Alliss is a gem. **Peter Dawson shrugs off the comments to American players not being used to the conditions and the vagaries of seaside golf. As for the sixth, Dawson shrugged. On the 11th, which is listed at 436 yards, the R&A moved the tee to the front of the championship box and shaved 10 yards off the length. Otherwise, the next available tee area was roughly 50 yards further up, he said. In hindsight, Dawson said the R&A should have constructed another tee area between the champion and members' regular tees. Even with the extra 10 yards, some players couldn’t reach the fairway grass, a carry of about 210 yards over intermediate rough, straight into the breeze. "It's another one into the wind," Dawson said stoically. "Links golf, tough day at the seaside." In this Elling blog post, he also reports that Dawson wasn't too pleased with early WD's by Sandy Lyle and Rich Beem. "I couldn't reach four fairways. You have to use common sense and they didn't. They put themselves in the league of the USGA at Shinnecock." Despite assurances that the weather would be taken into account during the setup, the tees on several key holes playing into the wind weren't adjusted, causing as many complaints as bogeys. Specifically, players said that the par-4 Nos. 6, 11 and 16 were not reachable in regulation, even with 3-wood approach shots. It used to be that the U.S. Golf Association was reputed as the most sadistic organization in golf, though their reputation has softened in the past couple of years. Not to worry, because the Royal & Ancient rushed to the fore to fill the Draconian, dunderheaded void. American veteran Jerry Kelly called it the biggest gaffe he'd seen at a major, including the controversial 2005 U.S. Open at Shinnecock Hills, where play had to be suspended after a green became sun-scorched and unplayable. "Worst course setup I've ever seen," said Kelly after finishing with an 83. "I couldn't reach four fairways. You have to use common sense and they didn't. They put themselves in the league of the USGA at Shinnecock." Hey, is there an echo in the room? "If it had been run by the European Tour, the tees would have been pushed forward a little bit," said overseas veteran Graeme Storm, who shot 76. "It's hard enough to hit the fairway, much less reach them." An unseasonably wet spring has rendered the thick stuff thicker than it should be; a recent dry spell means fairways harder and faster than anyone would wish them when the rough is this harsh; and a golf course architect with a misplaced sense of humour has disfigured this jewel of a links with one green - the 17th - with all the features required for crazy golf save a miniature windmill. The R&A's stated intention over the next four days is to identify the champion golfer of the year but, come Sunday evening, the gentlemen in blazers could be handing the trophy to the last man standing. Bob Harig says Mother Nature is going to play a big role in this one. More than a few players limited their time on the course to just nine holes, figuring it was no use. Better to spend time putting and chipping -- facets of the game that will be put to the test -- instead of battling the elements. "If it stays like this, the winning score could be double digits over par," said Ron Levin, who is caddying for Fredrik Jacobsen. "Yeah, this is all you would want," said Masters champion Trevor Immelman. 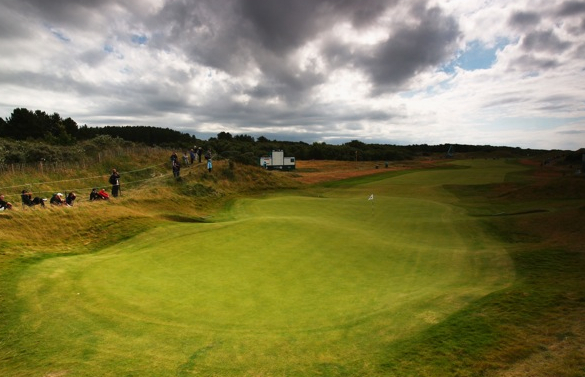 "In my opinion this is the toughest golf course I've played on the Open rota. It's very demanding off the tee. ... This is going to be a great test this week, especially with some of the weather that's been forecast. The guy who wins this tournament on Sunday is going to be very deserving of it." James Corrigan quotes Padraig Harrington about the state of his wrist and the state of the course, which Harrington predicts will deliver "absolute carnage" while Corrigan drops the first '99 Carnoustie suggestion. Steve Elling considers Lefty's chances and Gene Wojciechowski believes Tiger's absence puts more pressure on Mickelson. John Daly was brought into the press tent Wednesday and a controversy erupted (I know, stunning). Seems Butch Harmon is now to blame for Long John's inability to get sponsor's exemptions. Bob Harig's take is accompanied by video of the press conference. What boggles my mind is why Daly was even invited to the media center. The guy hasn't had a top-10 finish since October 2005 and has made just three cuts in 12 starts in '08. Apparently, the British press requested his presence, surely aware that when Long John Scapegoat gets anywhere near a live microphone, the ensuing maelstrom of unaccountability will produce several pages of tabloid-friendly grist. Daly was due to tee off at 9.42 today against doctor's orders, having suffered tendinitis in his left elbow and recently had a cyst removed from his right hand. "It's an Open and it is very special to me," said the Californian. "I told him [the doctor] I'm going to play, no matter what." Californian? The piece also includes "Four things other than an outspoken coach that might have 'destroyed' John Daly's life 'for a bit'." Richard Williams says the Open provides us a chance to imagine what the game would be like if Tiger was never invented. Well that's certainly a unique way of looking at things. Regarding the other hot player not in attendance, he grew a little cranky today in Milwaukee. And not because he's in Milwaukee. “I just don’t understand it. I don’t know why they’re ripping me,” Perry said before the pro-am Wednesday. Claire Middleton tells us how much tennis Greg and Chrissy have been playing and asks him what he thinks of the 17th green. A prolific course architect, Norman also had a view on the controversial 17th green here. "They could have done a better job," he said. Warning! This could be great or a total disaster: Gary Van Sickle and Alan Shipnuck will be live blogging round 1. Golfweek staff picks are in, too late I'm afraid. Golf Digest's Mike O'Malley has been culling Birkdale related nuggets at GolfDigest.com (including today's quote above). They make for nice contextual setters in case you are still struggling to get in the mood for the Open. You can read them here, here and here. Also, there are other sports vying for those two slots, including baseball and softball, which will be part of next month's Olympics in Beijing but are dropping out for 2012 and reapplying. The other candidates for 2016 are karate, roller sports, squash and rugby seven. I asked Juan Antonio Votaw to explain rugby sevens, and he said, "It's a quicker version of the sport, which usually has 15 players per side, instead of seven." I guess it would be like having a basketball game of three-on-three instead of five-on-five. Votaw assured me, however, that if golf makes it, each match will last the regulation 18 holes, not nine, or six. Votaw concluded that he is honored to accept his new position, which does not mean he is severing any ties with the PGA Tour or moving to China. Wait, and one more finally...the Principal is back, just in time for the Open. Look out Monty and the BBC! This great white ship supposedly “cruises through the sand hills” of the championship course, carving through the grassy waves despite its rounded front and emphatically lateral orientation — both of which features are historically disapproved of in the design of boats of all sizes. “Sounds more like a clubhouse,” mutters a chap at the back, who is immediately ejected from the meeting. "I think you can expect to see something about this in the next three to four weeks." Peter Dawson did double duty Wednesday, first sitting down for a joint Olympic bid press conference followed by an R&A Open press conference that was about as tense as a post-Oscar win Q&A session. Q. Unrelated to this week, how are you guys doing on the U grooves, V grooves thing? There's a perception in the States that it's the R & A that's dragging its feet on that implementation. Fairly or not, maybe you can address that and tell us when you see that coming on-line, if at all, and what the hold-ups and hurdles might be. PETER DAWSON: Well, the current status of that is that there's been some additional testing conducted just in the last few weeks in the women's game, at LPGA Tour events, and the results of that are just coming through now, which I don't think has changed anything. And I think you can expect to see something about this in the next three to four weeks. Q. A firm date for implementation? PETER DAWSON: No, that was an announcement in three to four weeks. I'm not going to preempt what that says. Well that's news, right? Until 3-4 weeks from now when we don't hear a thing. Q. Peter, there's been one or two criticisms about the 17th green. I just wondered what your thoughts were on that. PETER DAWSON: I think I flagged up very early on this year that the 17th green might attract some comment, and it has, very eloquent comment from some, not so eloquent from others (smiling). The green is undeniably different from many others on the golf course. I've spent with others quite a long time on it in the last couple of weeks. With the pin positions we have in mind I'm quite happy it's perfectly playable, and we know the score; I'm sure the green will be reviewed after the championship to decide what its future is. But as far as this week is concerned, it's going to be perfectly playable. Yes, he flagged it. Of course, having helped design it that's a bit odd. The great thing about this Open is that we won't have to read many stories about Tiger, instead we're getting...wait, no, really? Yep, will golf/The Open/the planet survive without him? Of course the answer is no, but everyone does their best to say otherwise. Less understandable and forgivable has been the rush in some quarters to argue that a victory this week will be devalued by Woods' absence, that Sunday's winner might go down as the "asterisk champion". "Does the trophy engraver know how to do an asterisk?" joked Geoff Ogilvy when asked about the impact of Woods' absence on the week ahead. "He adds to every tournament he plays in. But the Open is the Open. If any tournament is strong enough to stand up when he is not around it is this one." Ernie Els also paid homage to the player who time and again has stood between him and major championship victory, suggesting that the atmosphere around the course felt "very different" because Woods was not around. But, like Ogilvy, he preferred to make light of the subject. "I am not overly disappointed he is not around - as a player," he said, smiling. "But this is the first major he has missed since he turned professional and it feels different. We are going to miss him." Mark Cannizzaro and Ronan Rafferty duke it out over what Tiger's absence means. Steve Elling (here) and Derek Lawrenson (here) also tackle the subject and quote various players. "We gamble billions of dollars in this country, and the Internal Revenue Service doesn't get a dime," Trevino said. "Instead, they spend millions of dollars trying to catch these people. I don't see anything wrong with it. And I bet more players are doing it than will admit." He also includes a follow up on the Tiger effect on betting this year, with an interesting quote from a bookie about the "premier betting situation of the whole year." Peter Dixon offers a nice, succinct overview of the various ways players are preparing in the stiff breezes and based on what he's seen so far, suggests that it could get ugly if forecasted winds arrive. Lynne Truss considers Birkdale's standing as a spectator course. Rich Lerner, still waiting on his luggage to arrive (Kelly, can I borrow some foundation?") offers "hooks and cuts from Birkdale." Gary Van Sickle makes his picks and installs Sergio as the favorite. David Dusek with a great little golf.com blog post about the disgraceful way Ian Poulter treated the Birkdale putting green. And finally, John Garrity says all of the other greens should be rebuilt to look just like No. 17, and that's why he writes about courses instead of designing them. It's only Tuesday and Mt. St. 17th-Green-At-Birkdale is about to erupt. Just imagine the possibilities when the tournament starts and the wind blows! Before we get to the articles and after a lengthy search (because Lord knows we need more photos of guys hitting out a bunker), I finally found a shot of the 17th green in Golfweek's roster of images from Tuesday (the volume lowering tool is in the lower right). "If Birkdale were a one-hole course this green would be out of character with the rest of the course. It's out of character with the land; it's out of character with the hole. "You can see from 250 yards away that something has gone wrong. Sadly, it could be a decisive factor in who wins the championship. You could get some really crazy putts going on there. Funky bounces, too. A guy could hit a great shot in and see his ball take a really weird kick left or right. It's fine to have a tough green, but it has to look right. It just doesn't fit the spot that it is in, or the hole that it is on, or the rest of the course." "The problem is that whenever they try to change these great courses, they always stuff it up by doing something like that. You can argue they do these things because of how far the ball goes these days, but this has nothing to do with that. It's a mess that has obviously been made by someone who doesn't know how to design golf courses. He's built a green that isn't even close to the other 17. It's just stupid. If they revisit it after the championship I hope they use someone else." "In previous Birkdale Opens the 17th had been the easiest or one of the easiest holes," said Hawtree, who will lay out Donald Trump's proposed new course near Aberdeen should the present public inquiry into the project give the go-ahead. "So it needed stiffening. We moved the green back to the point where the front of the new green is where the back of the old one was. Then we added another tier. In my original concept of the hole there was nothing at the back of the green. The two big dunes there create an amphitheatre effect so I felt that the green should run on into a hollow at the rear. I wasn't allowed to do that though; the R&A wanted spectator mounds. So now the green forms too much of a bowl shape. "I'm taken aback by the depth of the reaction. It was a weak hole and demanded something be done. I have heard that the club want to redo the green complex after the Open. I'd be more than happy to move the mounds at the back and create my original idea." Just guessing by the comments, the lack of a rear hollow seems to be the least of the problems here. "Well, this has caused a little bit of controversy," he said. "And, as a result of that, I'd like to say a few things about it. It's a par 5, so it's not as if we're expecting the green to be hit at with long irons. It's a green the pros are accustomed to facing on many of the courses they play. "If you look at Augusta, there are probably 18 more sporty greens than this one." Lee Westwood echoes some of his fellow competitors' concerns about the 17th green, which is described in the official course guide as a "tiny, two-tier target with extreme undulations". "I think everybody has accepted that something has gone wrong with it," said Westwood. "It's just out of character with the rest of the course, (let's] basically leave it at that. "It's not to the standard of the rest of the greens. The rest of them are brilliant." Buteau also shares the same excuse reply from Dawson and I thought by printing it again it would make sense, but it still does not. Dawson said organizers weren't expecting many golfers to attempt to land their second shots on the putting surface. So if the green could be "hit at" with long irons, that would make it better or even worse? I really need Peter's book of design guidelines to help here, because I think he's really onto something. Competitors such as Stricker said they wish they could roll back the clock. One labelled it "a sloping mess of mounds" while another concluded that it looks as if it's "contracted a severe case of mumps". Even those not totally anti the mogul run have agreed that it is not in keeping with the other greens that have help confirmed Birkdale's reputation as the finest and fairest course in England. In Westwood's opinion they should unload the shovels and start again. That is exactly what the members are planning. But perhaps not before next Monday. Jack Nicklaus played here in April and was aghast. "You've got one of the greatest golf courses in the world, and they changed 16 holes because of a stupid golf ball," said the 18-time major champion. "That is just ridiculous." Okay, how did I miss one of the best quotes ever? Where did he say this? Please readers, guide me! Nicklaus was speaking for an ever-growing number who believe that the authorities should have placed limits on how far the modern golf ball travels. They failed to act, however, and now the only defence they appear to have to protect the dignity of old courses is either course lengthening or course toughening. Or in the case of the 17th, both. On occasions, the powers that be have gone overboard like at Shinnecock Hills at the US Open in 2004 when the greens were quick to the point of unplayable. The R&A is blessedly not the United States Golf Association and is not about to let their stubborn mistakes re-occur here. But they have created an eyesore. Slam, bam in the middle of golfing beauty. I'm not sure about the USGA reference, since they didn't create the 7th green at Shinnecock. It's one thing go blunder a set-up, because with a little bad luck, bad planning and a steep green, anything can happen. But to make a mess of things before you even set the course up takes a special talent that takes things to an entirely different level. This is yet another reminder as to why governing bodies should not design golf courses, particularly when it's in response to their own (continued) inability to regulate equipment. Doug Ferguson talks to players about the lush conditions. “This is the healthiest rough we've had in quite awhile,” Ogilvy said. “It's almost like a U.S. Open in that you've got 10 yards off the fairway to play with, and if you miss it beyond that, then good luck trying to find it,” former British Open champion Ben Curtis said. “I think you'll see more big numbers than the other Opens. If you're 15 yards off line, you'll see some 6s and 7s. The most significant change was the 17th green, pushed farther back into the dunes, with severe contours and a steep change in elevation from the back of the green to the front. It was all new to Kim, who took last week off following his victory at Congressional. He played the front nine Sunday afternoon when he arrived from Dallas to help get over the jet lag, and those two hours made him feel even more tired. Jim McCabe offers several interesting notes, including one on Jay Williamson qualifying through the Deere and Martin Kaymer playing on in spite of his mother's recent passing. "He's arguably the best player in the world right now and I find it amazing he's not here," said Rose, who three years ago was prepared to travel to two majors as a reserve but missed out each time. "It's obviously one less guy to beat, because you could pretty much guarantee he was going to be on the leaderboard on Sunday," he added. Steve Elling talks to Rose about coming back to where he made his first splash, while John Hopkins files this video report with Rose recreating the famous hole out on No. 18. James Corrigan questions Kenny Perry and also buries a lede of sorts, reporting that Luke Donald is all but out of the Ryder Cup for this year. Lewine Mair profiles Geoff Ogilvy, who played golf at Hoylake, West Lancashire and Formsby before teeing it up at Birkdale. "What other major is there," he asks, "that you look forward not just to playing the course but all the others around it?" "I'm different and Boo's different - and Mike Weir's going to feel different because he's normal," said Montgomerie, capturing the situation to perfection. You can check out all of the pairings here.